What: Gavilan College is celebrating its 100th anniversary this year, and the college wants to memorialize this landmark occasion by hearing how Gavilan has impacted, influenced or changed your life. 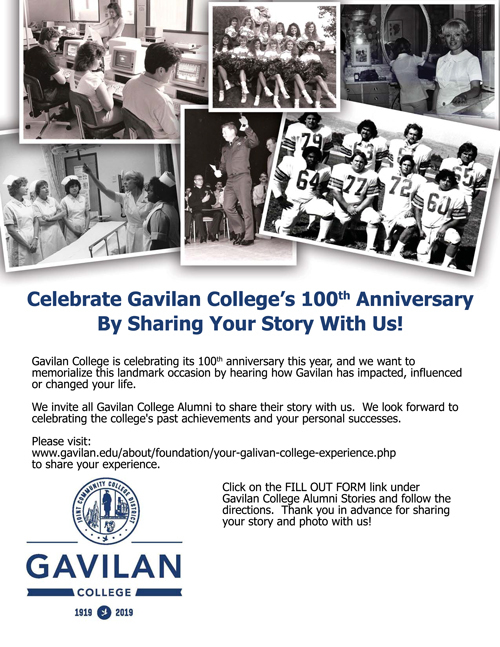 Who: We invite all Gavilan College Alumni to share their story with us. We look forward to celebrating the college’s past achievements and your personal successes. Where: Please visit www.gavilan.edu/about/foundation/your-galivan-college-experience.php to share your experience. How: Click on the FILL OUT FORM link under Gavilan College Alumni Stories and follow the directions. Thank you in advance for sharing your story and photo with us!